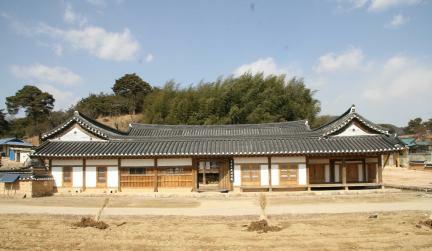 상주 양진당은 검간(黔澗) 조정(趙靖)이 1626년 지은 것으로 양진당 중수기를 통해 알 수 있다. 또한, 종도리에서 기록이 나온 것으로 보아 1807년(순조 7)에 중수한 사실을 확인할 수 있다. 상주 양진당은 전체적으로 정면 9칸, 측면 7칸의 규모의 ‘ㅁ’자형 평면을 한 고상식 건물로서 퇴칸 전면에 세운 6개 기둥은 통재를 사용하였는데, 특이하게 하층부분에는 방형으로 치목하고 상부는 원형으로 다듬었다. 지붕은 정침의 툇마루 상부만 겹처마로 하고 나머지는 홑처마로 하였는데, 겹처마의 경우 일반적으로 원형 서까래에 방형 부연을 얹는데 비해 양진당은 서까래를 네모지게 다듬어 부연과 같은 모습을 취하게 했다. 본채의 3칸 온돌방 전면과 3칸 대청 배면에 나있는 창호는 모두 중간설주가 있는 영쌍창이다. 이 건물은 소위 고상식 주거에 속하는 것으로 건물 바닥을 지면에서 1미터 이상 높게 마련하면서 고상식 주거에서는 보기 드문 구들을 설치한 점에서 조선시대 주거유형의 다양성을 보여주는 귀중한 사례이다. 방이 두 줄로 나열되는 겹집의 형식을 취하고 있는 점도 특색이며 기둥은 굵은 부재를 사용하면서도 모서리를 접어서 투박하게 보이지 않게 하는 기술적 성숙도를 보이고 있어 역사적·학술적·예술적 가치가 높은 건물로 평가된다. 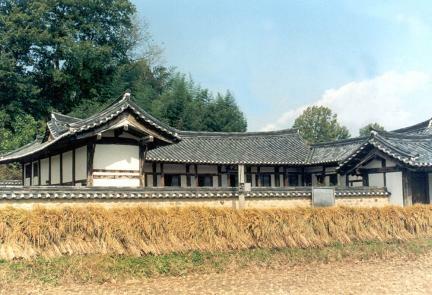 Jo Jeong (1555-1636, pen-name Geomgan), a civil official of Joseon, moved the house to the present location from his wife’s home town at Cheonjeon-dong in Andong. According to the construction document found on a purlin, written to mark the completion of the wooden frame and raising of the main crossbeam, the house also underwent major repairs in 1807 (the 7th year of King Sunjo’s reign). 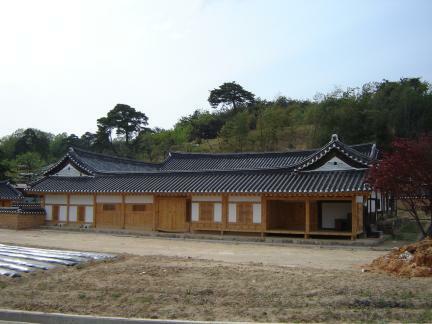 Measuring nine kan (a unit of measurement referring to the distance between two columns) at the front and seven kan at the side, Yangjindang, or the House of Truth Cultivation, is built on a square ground plan with a middle courtyard, part of the four surrounding wings with raised floors. The six columns along the front verandah are made of whole logs, trimmed square in the lower part and round in the upper part. 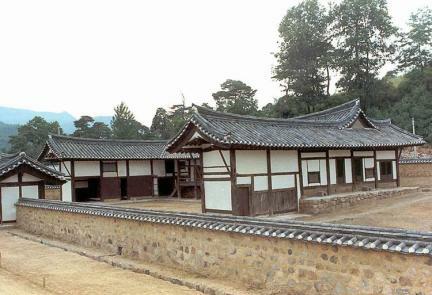 The main wing is raised over one meter above the ground but is uniquely installed with an under-floor heating system, adding diversity to the housing style of the Joseon Dynasty. The rooms in this building are laid out in two rows, with thick columns skillfully trimmed along the edges, demonstrating refined carpentry. The roof of the house has double eaves only on the section over the verandah, while all the remaining sections have single eaves. The rafters are square, unlike most other traditional houses that have round rafters beneath square flying rafters. The heated-floored rooms as well as the wood-floored hall in this building have double-jamb windows.